I've been reading a lot about the 7 Minute Workout lately. 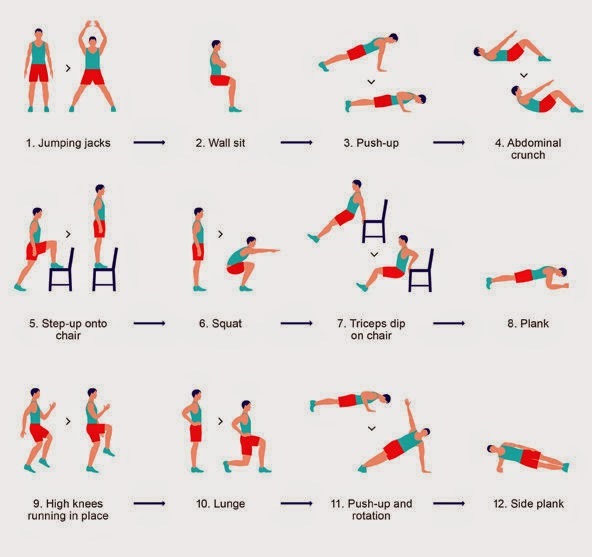 Basically, you do 12 body weight exercises for 30 seconds each with a 10 second rest between moves. I personally loathe lifting weights, but I love body weight exercises. Weight lifting feels so isolated to my body, while doing body weight exercises feels like I am usually working more than one area. All that said, I'm pretty intrigued by the 7 Minute Workout. My gym is pretty far from my apartment, so I don't make it every day. On the days I skip the actual gym, I like to do pilates or yoga in my apartment and I think the 7 Minute Workout is a great addition to my apartment fitness regimen. Plus, you can download an app or use this website to time the workout so you stick to that 10 second rest! Disclaimer and semi-spoiler alert: You are actually supposed to do the workout 2-3 times, so it's really 14-21 minutes, but that is still very short for an effective workout!